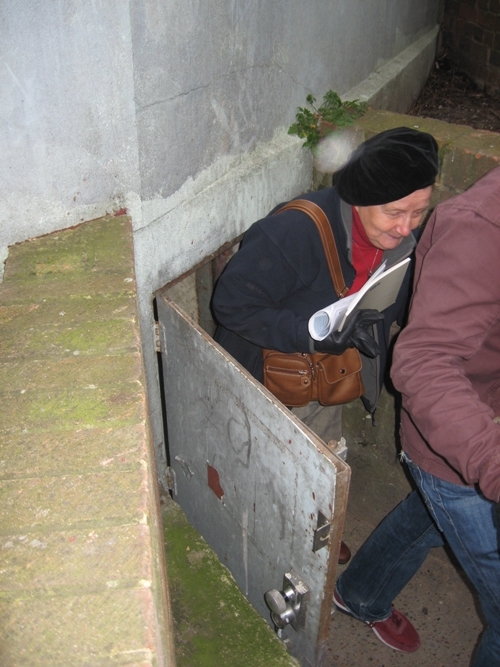 On Saturday 13 February, a group of the Bermondsey FROGs went to Rotherhithe to find out about the Brunels’ tunnel. Robert Hulse of the Brunel Museum first gave a talk about the building of the tunnel, the first ever constructed under a river, and then we visited the tunnel shaft, which is not usually accessible. Marc Brunel and his son Isambard Kingdom Brunel developed the tunnelling shield, where tunnellers work in compartments of the circular shield structure, removing a layer of earth at a time. The shield is then moved forward and the tunnel wall built up behind it. This is essentially the way modern tunnels are still built. But it was not nearly as easy as it sounds! Robert Hulse described the dreadful conditions in the tunnel, with Thames water seeping in constantly, a revolting health hazard given that the Thames in those days was full of sewage. 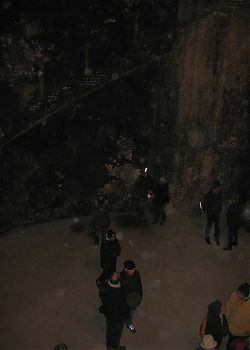 There was also a problem with methane gas, which was ignited by the flames from the tunnellers’ lamps. The air in the tunnel was so bad that men could only work for two hours at a time before collapsing. On several occasions there was dangerous flooding in the tunnel, and in one flood in 1828, Isambard, who was only 21, narrowly escaped being killed. A further, and continuing, problem for the tunnel was lack of money. The Brunels intended the tunnel as a solution to the problem of goods transport across the river, but in the end, they didn’t have the money to build entrances for horses and carts, and the tunnel was only accessible on foot. Since 1869, it has been used as part of the tube network, but it is closed at the moment while the East London Line is being redeveloped. 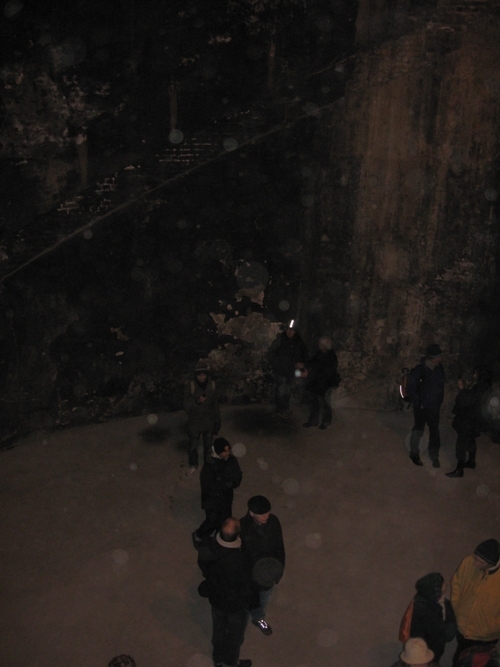 What we were able to go and see was the interior of the tunnelling shaft, which is not normally accessible. The shaft is an enormous hollow cylinder, which was sunk into the ground under its own weight, another Brunel innovation. Robert Hulse speaking to us from the temporary stairs down into the shaft. 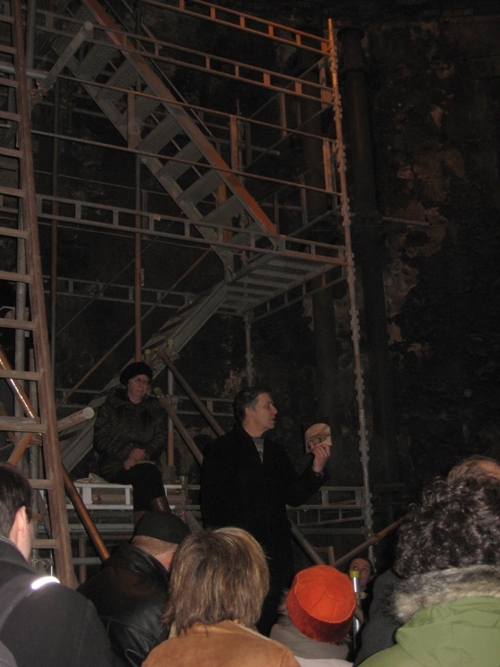 Once we were all safely down at the bottom of the shaft, Robert Hulse told us about the tunnel’s days as a major tourist attraction, visited by thousands of people who bought souvenirs in the shops which lined the tunnels. Fairs were held there with tightrope walkers, sword swallowers, Ethiopian musicians and other attractions. But it eventually became seedy and disreputable, and was sold to a railway company. It was hard to believe, standing in the vast, grimy shaft, that all this had once gone on just beneath our feet. But I got the impression that Robert Hulse, a bit of a showman himself, might have plans for something similar in the future!